How To Avoid Website Copyright Infringement! You can be liable for the content on your website if you use materials that rightfully belong to others. In simple terms, you can be liable for either copyright or trademark infringement for the content you put on your website. Most liability for infringement is from copyright infringement. So, the bulk of this post will focus on copyright infringement as it relates to your website content. Copyright infringement is a real and serious matter you need to be aware of if you’re going to conduct commerce over the Internet. The importance of avoiding claims of infringement cannot be understated. The economic ramifications resulting in any unauthorized use of another’s intellectual property could put you out of business. In some instances, you can even be liable for criminal copyright infringement and wind up facing jail time! In order to provide the best possible assurances beforehand then, you should understand what constitutes copyright infringement and how to avoid it. Most importantly, you should understand that each different element of your website can have a separate copyright. Basically, in order to be liable for copyright infringement, you must violate one of the five exclusive rights given to copyright owners under United States Federal law. Under copyright law, any “work” as this term is defined under the law is able to be protected. A work includes many items, such as books, maps, a musical composition, paintings, sculptures, etc. In terms of the content contained on your website, images that appear on your site, the text, applications (such as Java script) and even the html or other coding all constitute a “work” as defined under the Act. Each of these elements is potentially protected items and could be a source of liability. Included in the rights of ownership are the right to prevent others from reproducing (or copying) a work, publicly displaying a work, or distributing a work. As a result, you obviously need to take care not to copy and display the work of others. 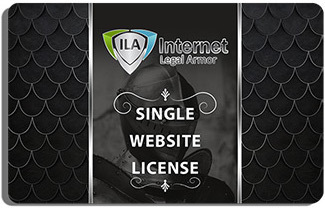 (An Internet service provider can also be found liable for copyright infringement even when they are not directly engaged in the copying of protected materials also). The separate website elements are discussed in detail below. If you use and display someone else’s photos, illustrations, videos and/or other graphic images without permission on your commercial website, you will infringe upon the owner’s copyright in those images. Most images, illustrations, videos, etc. you see displayed on the internet are protected from unauthorized use. Again, the exception is those items that are a part of the public domain (public ownership). The simple rule is: do not copy someone else’s illustrations, photos or videos. The moment an original image (or string of text) is put into some tangible, visible form, such as creating it and storing on your hard drive, it becomes a protected copyright. There are some exceptions with displaying images or videos through the use of inline links, as you will later. Some images, such as logos, may be copied, but only after the end user accepts the terms of a license agreement defining the permissible uses of the particular image. Most licenses restrict the user from altering the appearance of the image in any way, or require that the image be used as a link only to certain designated sites. Also, most software usually includes what are known as clip-art files. Using clip-art from these applications on your website does not violate copyright law, as these images are licensed to the purchaser of the software for this specific purpose. TIP! If you don’t create all of your images from scratch, then I strongly recommend that you pay for “stock” images and use a reputable site that stands behind the source of those images. Most stock image providers will warrant and represent to their customers that the images they are providing do not violate any copyrights or proprietary or other laws. Again, be sure to check the licensing agreement and other terms and conditions on the particular website to determine what representations they make. You may also want to check their policies to see what rights you have to any derivative works you create with those purchased images. For example, www.istockphoto.com is popular place to purchase website images. Like most royalty free image providers, they do not allow you to resell or incorporate an image or photo you purchase in other mediums, such as website designs, posters, logos, etc. intended for resale. The guidelines for text development are similar to those for images. Original text developed by you or the creator of the web-site may be used without fear of copyright concerns. However, as with any image, copying text from third-parties without permission is prohibited unless you have some legitimate defense, such as fair use. In most instances, you will be the one creating the text for your business’s website. Purely factual information (or ideas) may not be copyrighted, but the manner of expression and format of presenting those facts can be protected. If you use an existing photo, image, coding or any other protected work and substantially modify it, this could be infringement. New works that are based upon a pre-existing work may be considered to be a “derivative work.” A derivative work is a work based upon important or substantial elements of an original pre-existing work and uses enough of the original work to be “substantially similar” to the earlier work. Unless the defense of fair use applies (discussed more in the next section), creating a derivative work is copyright infringement. The original copyright owner maintains all rights to any derivative works. But, the bottom line is you should not try to modify and use some photo, logo, image, coding or any other protected work to create an, new work. For example, substantially modifying some existing source code and creating a derivative code based upon the original would likely be considered to be a derivative work. If, however, the resulting work turns the original work into something new or adds value, then it may be considered to be a “transformative work”. I really don’t need to expand upon this discussion other than to say website owners should not modify anything in the hopes they are creating a transformative work. It’s far too risky a proposition. Ideally, always create things from scratch, or purchase the rights to own or use a protected work. While the law provides that the creator of the non-infringing derivative work may have the right to claim the copyright, parties may alter their rights to a derivative work by written agreement. If you plan on having any derivative works created based on anything you own, always have a written, thorough agreement transferring ownership of the rights in the derivative work. Any unauthorized copying is an infringement unless the use falls within one of the very limited defenses, such as “fair use.” There is also the defenses of independent creation, first sale (owner of a lawfully made copy of a protected work has the right to sell, transfer or display his copy to the public) or expiration of the statute of limitations. However, use of another’s text, images or graphics on a commercial website is not likely to fall under one of these defenses. The same rules apply to using text, graphics or images on your website. The guidelines the courts use to make a determination of what constitutes “fair use” are in the form of a four factor test. The nature of the original work – if the original work is very creative, it may be harder for you to use the fair use defense. The amount and importance of the material used – if you take a substantial amount of material from the copyrighted work, or if you take material that is very important to the copyrighted work, it will be harder for you to prove fair use. There is no fixed rule here as to what amount of use is fair, however. The effect on the market for or value of the original work – copying is more likely to be fair use if it does not interfere with the market (which generally doesn’t include parodies or negative reviews) or diminish the value of the original work. Despite the fair use defense, the best way to obtain images or graphics for your website is to create them yourself or commission someone to create them. You can also purchase them and comply with any licensing requirements. It is difficult to determine in advance whether a given use is going to be held as “fair.” There are no concrete rules for determining fair use and case law has been inconsistent. So, you should always play it safe and avoid using protected third party works outright if you think it may be infringement. If you feel you must use some original image or graphic and can do so in a transformative way, absolutely seek the advice of an intellectual property attorney first.